Le Race Le Race :: 2016 PlaceMakers Le Race is Here! PlaceMakers Le Race is finally here and we can't wait to see you all on the start line. The weather forecast is looking perfect for Saturday so make sure you get your entry in. If you haven't entered already don't panic - we are taking online entries until midday Thursday 17th March and then we will be taking hard copy entries at Race Pack Pickup on Friday 18th March 11am - 6pm at Chain Reaction Cycles on Moorhouse Ave. Need a coffee fix while at you're there? Moorhouse Cafe 218 is just 20m away from Chain Reaction Cycles and on Monday - Thursday 7:30am - 11am they have buy one get one half price breakfast! For spectators leaving Christchurch on the morning of the event, make sure you leave by 8am to avoid getting stuck behind the cyclists. Click here for the spectator guide. NOTE: Please do not park your cars along Rue Jolie - Rue Lavaud or the finish line - this area is needed for race officials. Hill top parking - If you are parking at the Hill Top Tavern please be very mindful this is private car park and for those who want to visit the Tavern not just for PlaceMakers Le Race supporters. Please be very mindful that we are allowed to use their car park for a short time – it'd be great if you would support them by buying coffee or food. Portaloos will be on site for Le Race supporters to use. Please also stay off the road at the Hill Top - the road is still open to traffic. SPOT PRIZES UP FOR GRABS AT PRIZE GIVING! ​Good luck to everyone riding in PlaceMakers Le Race on Saturday! Have a great time and enjoy the journey to cross the finish line. We look forward to seeing you and your supporters over at Akaroa – stop by and say hi to grab a sausage for a gold coin donation, all proceeds going to charity. Best of luck from all the team at PlaceMakers. ​PlaceMakers Le Race has some extremely fast down hills, tricky descents and slippery cattle stops. In the best interests of rider safety, competitors must have their bikes and helmets safety-checked. These checks are free and available on week days only from 1st March - 18th March at Chain Reaction Cycles. While you wait why not pop in to Moorhouse Cafe 218 and grab a coffee? On Monday - Thursday 7:30am - 11am they have buy one get one half price breakfast! 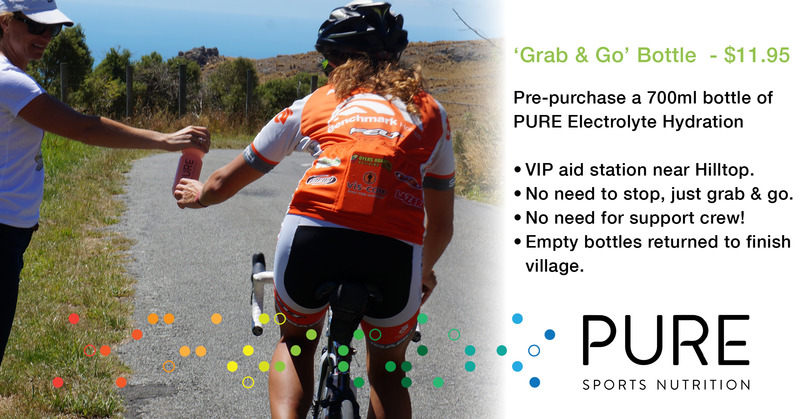 ​Make sure you stay properly hydrated during Le Race by taking advantage of the PURE Sports Nutrition ‘Grab & Go’ VIP aid station. For just $11.95 you’ll receive a 700ml PURE drink bottle filled with PURE Electrolyte Hydration…and best of all, you don’t need to stop! Just grab, and go. Come visit the team at the New Zealand College of Massage Tent. Help speed up your RECOVERY with a post-event massage. The Crew from Team CP will be out in force on Saturday morning at Le Race as bunch police to help keep everyone safe as well as support you and cheer you on to help you to nail your goals! Need something unique for your team uniform? Fat Robot is a digital direct to garment printing service designed around producing short run or one offs for your team uniform, business, club or group.Click here to visit our website and get started designing your own awesome range of clothing! Your kit will be available for you to collect at race pack pickup on Friday 18th March.Click here for info. If you can't race but want to experience everything about PlaceMakers Le Race, consider becoming a Volunteer. Without people like you PlaceMakers Le Race just wouldn't happen. As such, we treat volunteers at least as well as the competitors. Volunteers who sign up here will receive a free PlaceMakers Le Race T-shirt (RRP $40.00).